The Commerzbank-Arena got built in the place of the old Waldstadion. 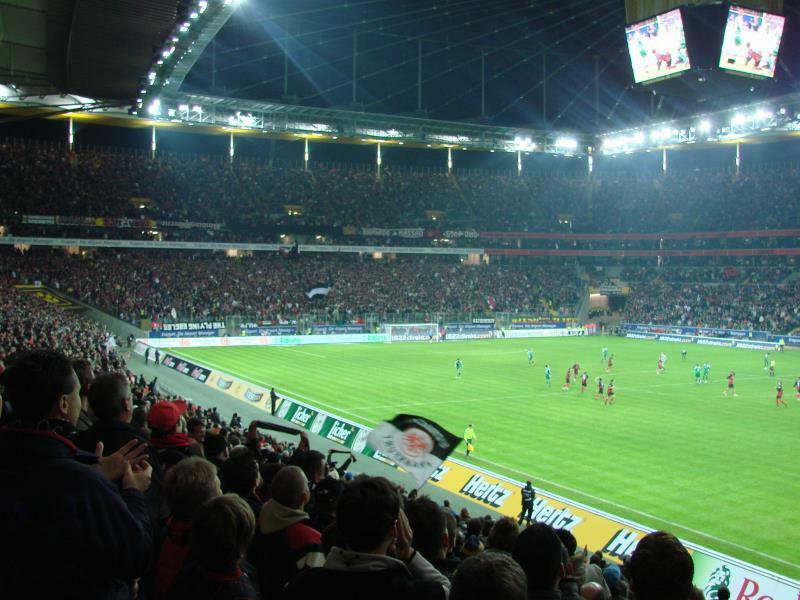 The last match at the complete Waldstadion was played in 2002, after which the old stadium got gradually demolished while the new stadium was built in its place. 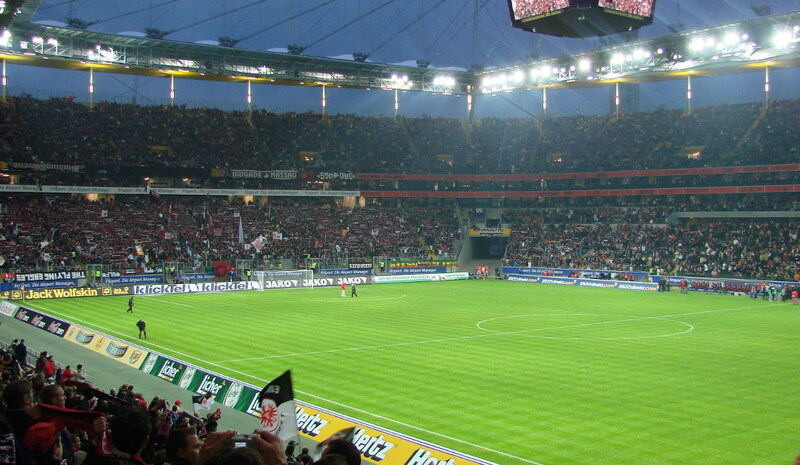 This meant that Eintracht could keep playing their home matches at the stadium. 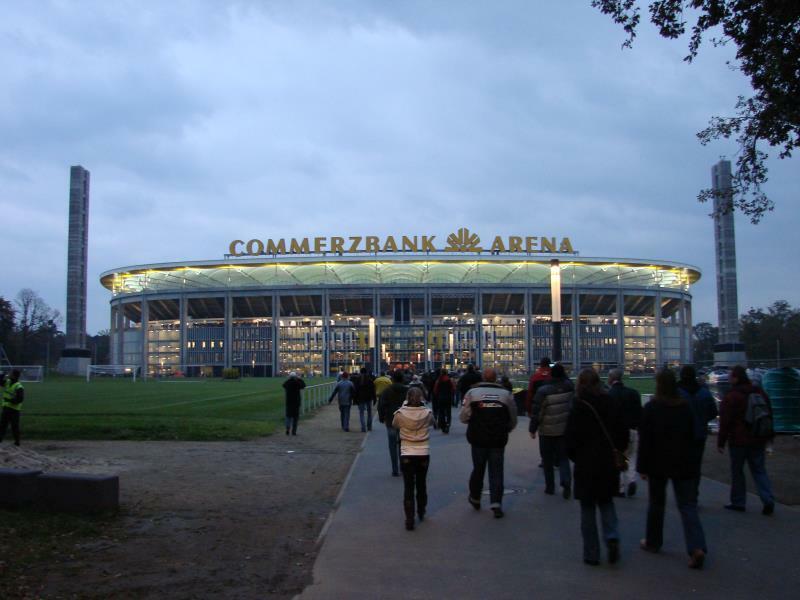 The Commerzbank-Arena officially opened during the 2005 Confederations Cup with a match between Germany and Australia (4-3). During the same tournament the stadium also hosted the final between Brazil and Argentina (4-1). The new stadium had come at a cost of €126 million. One year later the stadium was one of the playing venues of the 2006 World Cup. During the World Cup it hosted four first round group matches and the quarter-final between France and Brazil (1-0). Most notable feature of the arena is its convertible-style retractable roof, though it received temporary negative publicity during the Confederations Cup final when a defect caused a large stream of water to come down during a thunderstorm. The Commerzbank-Arena has a total of 2,200 business seats and a further 83 lodges that can hold up to 22 people. 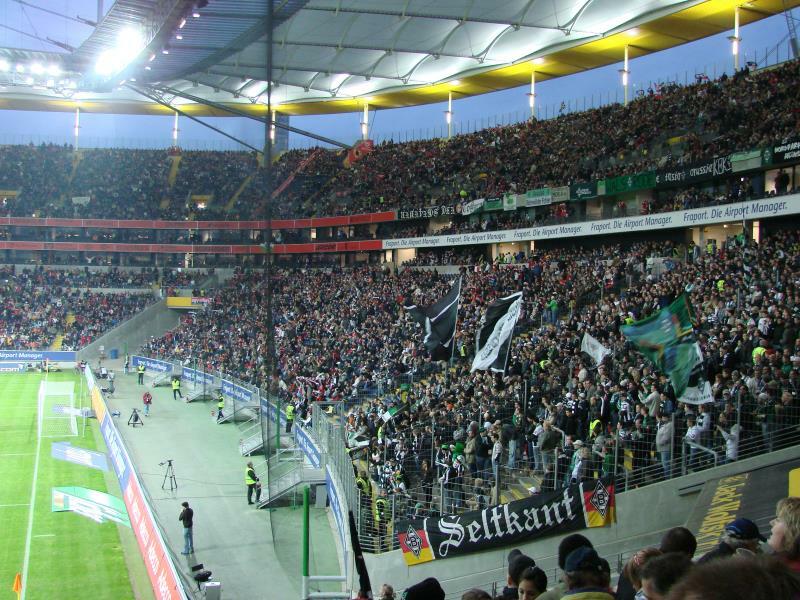 The Commerzbank-Arena is located in the south of the city of Frankfurt at about 5 kilometres from its city centre. The stadium lies close to where the A3 and A5 motorways intersect. From the A3 take exit Frankfurt-Süd toward the B44. Follow for Stadtmitte. The stadium will be signposted with a stadium symbol. If using public transport, the stadium can be reached with S-Bahn lines S7, S8, and S9. From Frankfurt’s main rail station (Hauptbahnhof) take train S8 or S9 in the direction of Mainz or Wiesbaden, or line S7 in the direction of Goddellau. Get off at stop Stadion. Line S8 and S9 can also be boarded at other city centre stations. An alternative is tram 21, which leaves from the main rail station and crosses directly to the south bank on its way to the stadium. Get off at stop Stadion, which is the last on the line. On matchdays tram 20 follows the same route as tram 21. From Frankfurt’s southern rail station (Südbahnhof) you can take bus 61 to the stadium. Take the bus in the direction of Flughafen and get off at stop Stadion/Osttribüne. Frankfurt has one of Europe’s largest airports and has direct connections to pretty much everywhere in the world. The international airport is located south-west of the city in the same direction as the Commerzbank-Arena. In fact, it’s just one stop from the airport with S-Bahn line S8 or S9. Frankfurt’s low cost airport, Frankfurt Hahn, is a lot further away though and requires a bus ride into the city, though you could get off at Frankfurt International and take the S-Bahn from there. 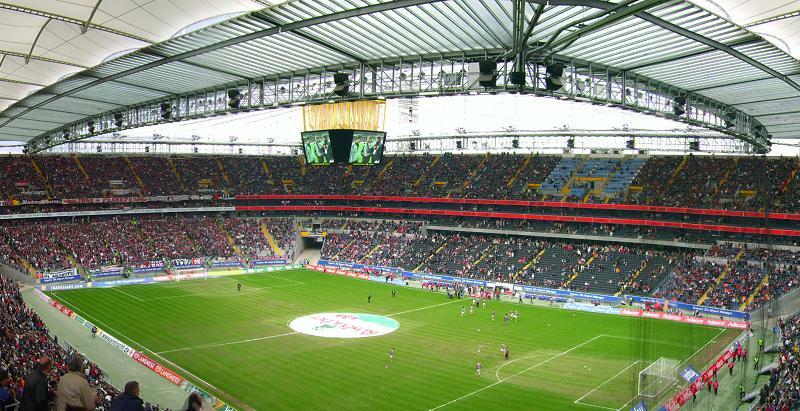 The Commerzbank-Arena is part of a sports complex that is located on the edge of the city and bordered by forests. It’s a pleasant area if it’s a nice summer’s day, but otherwise there is not much around and eating and drinking is best done in central Frankfurt. If you wish to stay close to the arena, then the adjacent Lindner Hotel will be an excellent choice. The Holiday Inn Frankfurt Airport, Melia Frankfurt, and Sheraton Frankfurt Congress are decent alternatives, but require some walking to get to the stadium. Click here for an overview of all hotels near the Commerzbank-Arena, and here to explore the options in other parts of Frankfurt. Tickets for Eintracht Frankfurt matches can be bought online, at the Fan-Shop at the Commerzbank-Arena, at the Fan-Shop at the An der Hauptwache 1 in the city centre, or at one of the other sales points. If tickets remain available, these can also be bought on the gate on the day of the match, though Eintracht do sell out a few of their home matches in a season so booking in advance is recommended. If you do miss out and the match is sold out, secondary ticketing websites like viagogo are a generally reliable alternative, though expect to pay well over face value. Eintracht have divided their home matches into five pricing categories. Tickets in the most expensive category (A) range in price from €40.00 for an upper-tier seat in one of the corners to €85.00 for a central seat at the main stand. Tickets in the cheapest category (E) cost between €23.00 and €55.00. A ticket for the standing area costs €15.00 irregardless of the category. Tickets are €2.00 more expensive if bought on the day. For more information call +49 (0) 180 50 60 303 or email info@eintrachtfrankfurt.de. You can find a seating plan here. 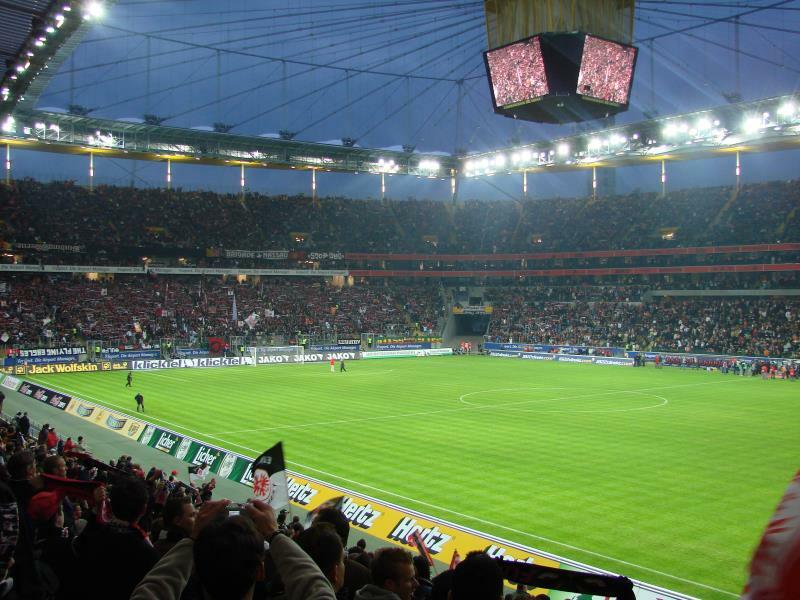 The Commerzbank-Arena offers guided stadium tours that include the dressing rooms, VIP facilities, press areas, and the Eintracht Frankfurt museum. The tours last 60 to 90 minutes. Tours run irregularly from one up to a few times a week, typically on the weekends. Check online for current dates and hours. Reservations can be made online. The tour costs €9.00. For more information call +49 (0) 69 23 80 80 121 or email fuehrungen@commerzbank-arena.de. Eintracht.de – Official website of Eintracht Frankfurt. Commerzbank-Arena.de – Official website of the Commerzbank-Arena. Frankfurt-tourismus.de – Frankfurt tourist information. RMV.de – Public transport information for the Rhine-Main region.